London Fashion Week is well underway but animal rights activists have taken to The Strand to protest the industry’s use of fur. 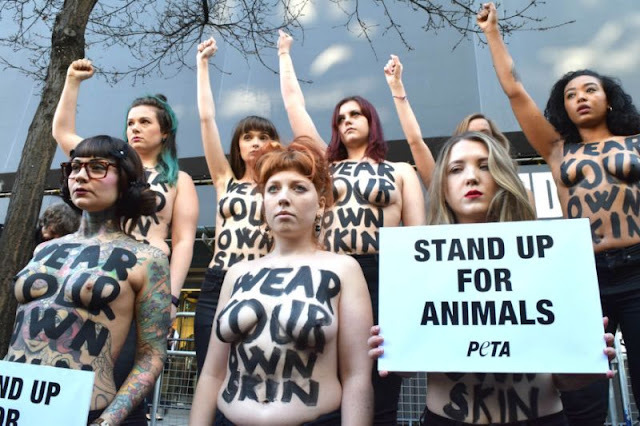 A group of female PETA supporters braved the February chill to don the painted slogan, ‘Wear Your Own Skin’, across their bodies. And the activists urged FROW regulars and street style stars attending the shows to ditch fur, leather and shearling numbers from their wardrobes this season. The initiative – whose motto is ‘Animals Are Not Ours To Wear’ – regularly campaigns to raise awareness of fur farms, where animals are slaughtered by poison or electrocution for their skin and fur. According to PETA, more than a billion animals are killed for leather every year under conditions that include extreme crowding and deprivation. Some also undergo procedures such as castration and dehorning without any painkillers. 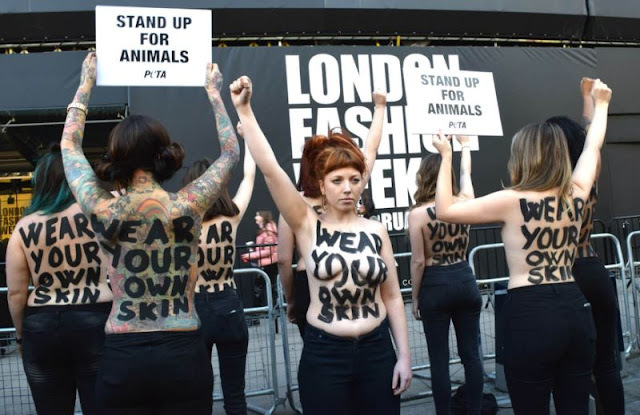 And as it is just day one of the fashion weekend, it’s likely that the animal rights organisation will have further protests lined up. But PETA is no stranger to staging demonstrations, as protesters took to the streets to urge the industry to give up fur last season through the use of distressing images and videos of slaughter houses.